Where do I use my DIY Direct voucher code? Founded in 2006, DIY Direct has evolved into one of the largest online retailers in the UK specialising in gardening, electrical, decorating and much more! Located in a small town called Wilmslow in Cheshire, The DIY Direct warehouse has over 10,000 products online ready to be shipped to you as soon as tomorrow. The reputable brand pride themselves on providing an excellent customer service team which they say is what makes them stand out above others in this competitive market. The team are always on hand to go above and beyond the call of duty for their customers so don’t hesitate on giving them a call if you have any queries. The packing team is too an asset to the company who work hard to ensure all your orders get sent out as quickly as possible and are packaged well. Whether you’re taking on a spot of gardening or you’re looking to refurb your house, whatever DIY task you’re taking on, DIY Direct have got you covered. You can also enjoy a great selection of homewares and accessories including candles, tableware, glasses, clocks, dining products and much more! 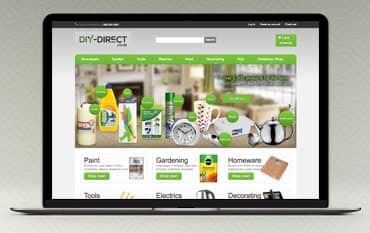 Shop online at DIY Direct today and see what bargains you can pick using one of our Offer Codes which can help you make a great saving at the checkout which is guaranteed to make your shopping experience more exciting. As well as DIY and gardening Products for your home, at DIY Direct, you can also find a the Christma Shop collection! Christmas is one of the most special and remembered times of the year so why not make it extra beautiful with something from DIY Direct. Kaemingk is one of the leading brands in the Christmas market and DIY direct are the proud stockist of their stunning products! Browse for Christmas Trees, Christmas Lights, Baubles and much more online today and start preparing for the big day the right way with DIY Direct. When it comes to your home, we here at NetVoucherCodes know just how expensive it can be to gather all the equipment you need to do those all-important jobs yourself! It’s for this reason that we feature a wide array of DIY Direct Discount Codes and Offers right here on our deals page which is designed to help you save money on your order at the checkout. Before you next shop online at DIY Direct, be sure to check our page out beforehand so you can make your next shopping experiences more enjoyable and even better, guilt-free. If you’re not a fan of going to the garden centre of DIY store for your gardening products and tools, DIY Direct have got you covered from the comfort of your own home, Not online can buying online help you save money, but it will also save time. Whether its garden compost, garden power tools, garden hand tools or furniture - all this and much can be delivered straight to your door. No matter what you’re looking for, DIY Direct is the best online destination for everything you garden could need and more. You can even find a selection of Barbecues, Caravanning and Camping Products along with a wonderful selection of hanging basket and watering cans. Create a garden you can be proud of for less with a Voucher Code at DIY Direct to when you browse our deals page here at NetVoucherCodes. Diy Direct is a great place to find the best deals around for all the household electrical appliances you need! Shop small appliances, batteries, lighting, security, light bulbs and much more. With over 2,000 products in this section alone, you’re almost certain to find what you’re looking for. Paired with a speedy delivery service, shopping online for electrical goods has never been easier. If you spend over £40, you will also qualify for Free Delivery with your order. Depending on which zone you’re located determines your delivery cost. DIY Direct offer a no quibble 14-day money back guarantee for all goods shipped correctly that are not required. If the item is not required, please send the item back for a full refund in its original condition, unused with its original packaging. At DIY Direct, you can expect one of the largest collections of DIY products in the UK with over 10,000 products available in stock for next day delivery. Featuring a huge selection of gardening products, electricals, DIY, paint, household items and much more, whether you’re renovating your home or doing a touch of DIY, everything you need for any job big or small can be found online at DIY Direct. Shop for your next toolset, garden furniture or decorating materials for less when you use one of our DIY Direct Voucher Codes which you can find here on our NetVoucherCodes deals page making your next purchase cheaper than you think.